List of Important news about the Railway Budget 2015-16 which was presented by our Railway Minister Mr. Suresh Prabhu was given below. 1.) Toll Free help line– 138, and security complaints- 182. This will work for 24X7 over all India. 2.) Surveillance Cameras will be placed in selected mainline coaches and in ladies compartments. 3.) Rs. 120 crores was allotted to provide lifts and escalators. 4.) New modern facilities will be provided fordisables, senior citizens, patients throughIRCTC. 5.) Separate Department for Railway Cleaning Process. 6.) Mumbai – Ahmadabad Bullet train project proposed. 8.) We can purchasethe unreserved tickets from our smart phones using debit cards. 9.) Under the scheme of Digital India, will providefree Wifi in B Class stations. 10.) Facilities formobile phone charging in all compartments. 11.) Transport Logistics Corporation of India will provide end to end logistics solutions. 12.) “Operation 5 minutes” is a scheme that allows the passengers to buy unreserved tickets within five minutes while entering the station. 13.) Railway minister has introduced a council called, “Kayakalp” to provide innovation ideas and business rearranging in railways. 14.) There isno change in train fare. 15.) 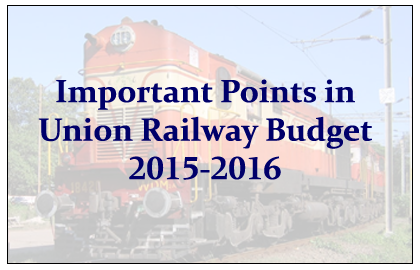 Theoperation ratio of the railways in 2015-16 will be88.5%. 16.) Passengers can book their tickets120 days prior from the travel date (it was 60 days before). 17.) Passenger’s linen and bedding will be designed by “NIFT”. 18.) User friendly ladder for climbing upper berth will designed byNational Institute of Design (NID).